In 80's Yugoslavia planned to built own fighter jet Нови Aвион (Novi Avion = New Aeroplane), designed by Ваздухопловнотехнички институт (Air Technical Institute) in Belgrade in cooperation with French Dassault. In meantime, until new aircraft will be ready, two existing aircraft were tested: MiG-29 in 1985 and Mirage-2000 in 1986. Soviets offered a better price, so MiG won a "contest". In 1991 Yugoslavia disintegrated and Novi Avion programme was canceled. 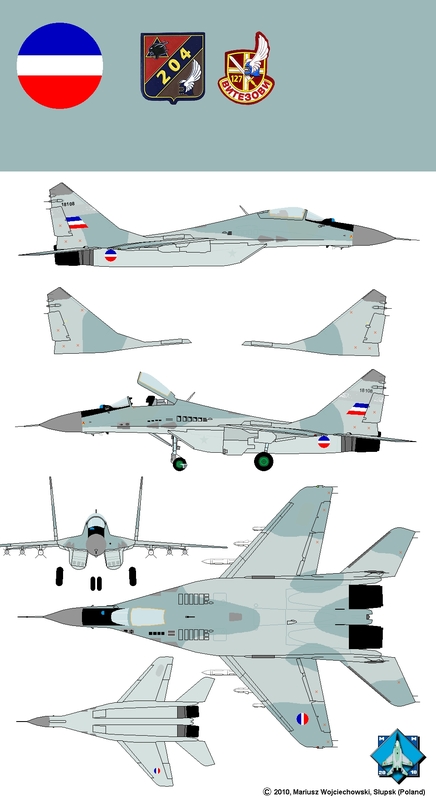 Yugoslavia obtainded MiG-29 in slightly degraded version 9-12B, not 9-12A! Only five MiGs survive NATO's operation Allied Force. Four were destroyed on the ground, six were shot-down and one is crashed. 204. 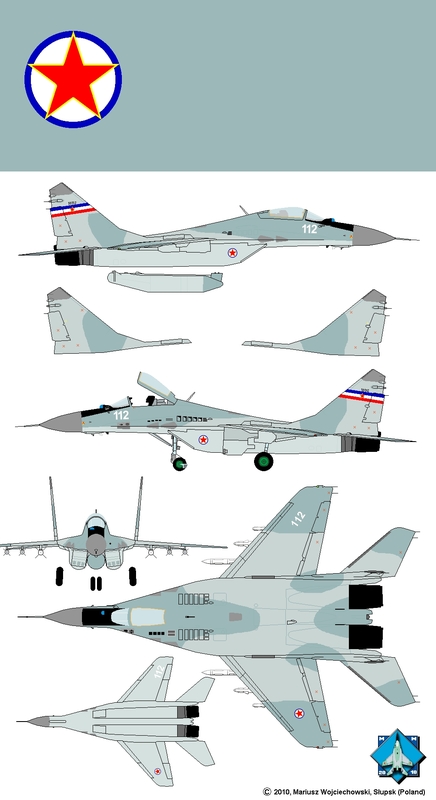 LAP Lovacki Aviacijski Polk (Fighter Air Regiment) have two squadrons, one with MiGs-29 - 127. LAE Lovacka Aviacijska Eskadrila (Fighter Air Squadron) and second 126. LAE equipped with MiG-21bis (L-17). Numbers it's a three last digits of the aircraft's number. Local name of MiG-29 is a Serbian designation L-18 for Lovac (fighter). Local name of MiG-29UB is a Serbian designation NL-18 Nastavni Lovac (trainer fighter). MiG-29 no. 18112, SFRY Yugoslavia 1989. Standard MiG's camouflage. MiG-29 18108, Serbia & Montenegro 2004. Markings were used in FRY.